Taurus Hill Observatory | Asteroid 49 Doris observed at Taurus Hill Observatory. Posted January 6th, 2008 by Harri Haukka & filed under Asteroids. Asteroid 49 Doris is a very large object. It has a diameter of 222 km and the rotation time is about 11,9 hours. 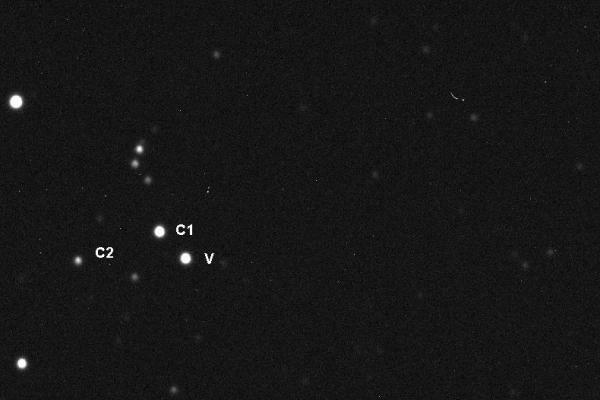 At time of the measurements that were made 5./6.1.2008 at THO, the asteroid Doris was in the Lion constellation. The purpose was to measure the half of the light curve, but due the nearby star, some of the measurements had to be abandoned. Therefore the light curve presents the measurements from the four (4) hours on the revolution. The measurements were taken with the photometric R-filter with 120 sec. exposures. The comparison stars were GSC1.2 catalog stars 0023400425 (C1) and 0023400491 (C2).